This post originally appeared on Next Billion’s blog and is reposted here with permission. About 3 billion people in the world either have no account or have an account that sits unused. 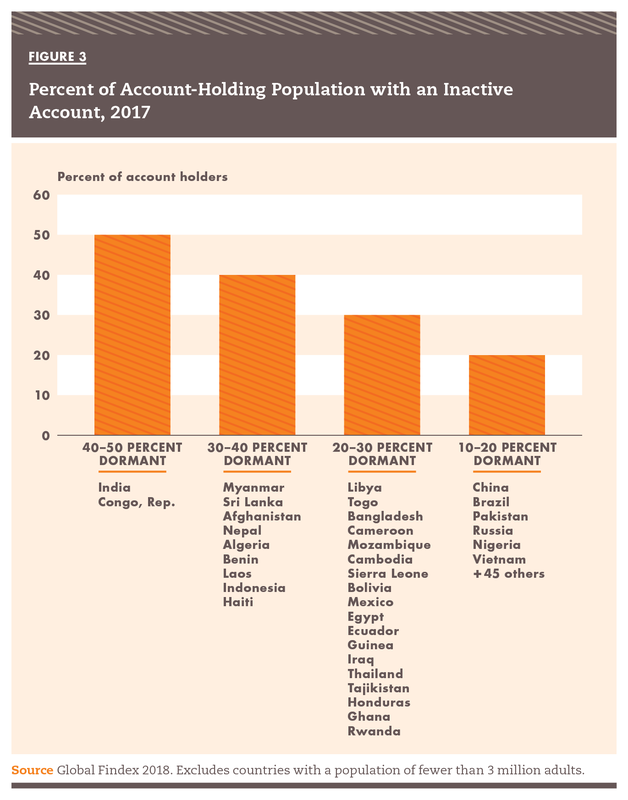 The countries with the largest number of financially excluded people are also the highest population countries: India and China. This picture has changed little in the past three years. 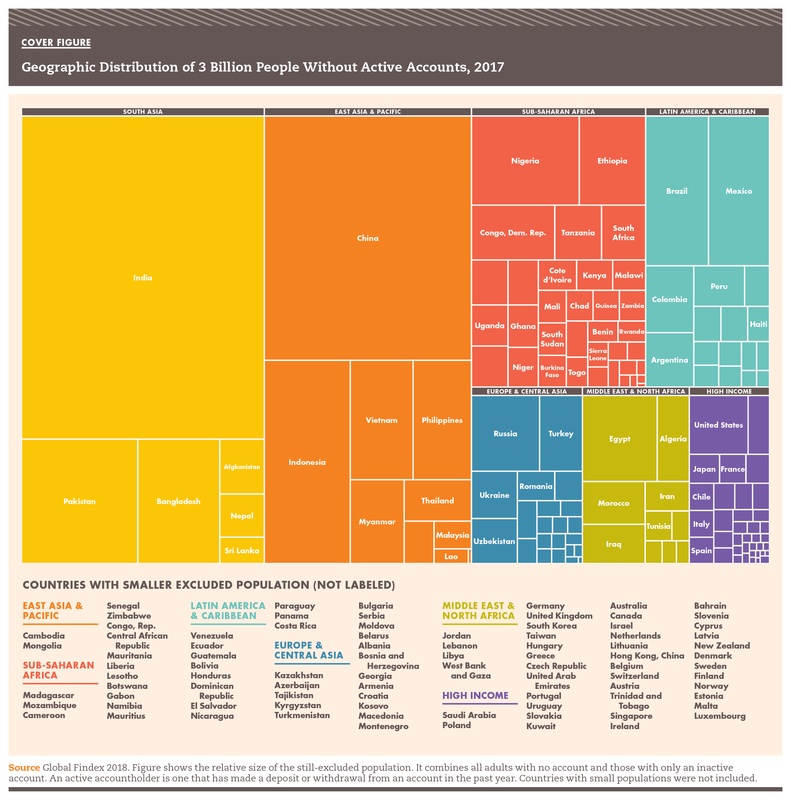 The Global Financial Inclusion Database (Findex) is a survey of the financial habits of adults in 144 countries with data from 2011, 2014 and now (2017). Governments, foundations, big financial companies and fintechs alike rely on the Findex to understand how people are using (or not using) financial services. It is the best available yardstick through which we measure global progress toward financial inclusion. Unfortunately – as we share in our recent report, Financial Inclusion Hype vs. Reality: Deconstructing the 2017 Findex Results – while we see a few bright spots, the overall results in the latest survey are decidedly less exciting than they were in 2014. The World Bank, which houses the Findex, announced the 2017 results with the headline that 69 percent of the world’s adults now have bank or mobile money accounts – which represents good progress toward its target of “Universal Financial Access” by 2020. We agree that connecting hundreds of millions of people to the formal financial system is worth celebrating: If nothing else, it serves as heartening evidence that a sustained movement involving the private and public sectors in nearly every country can meet an important global challenge. But that headline is deeply misleading, for two reasons. First, and somewhat embarrassingly, many new accounts are simply dormant. The accounts of a fifth of reported account-holders have had zero activity in over a year – no deposits and no withdrawals. If a small shop owner has a bank account but does not use it, the account is valueless to her and a burden to the financial service provider that invested in technology, staff and infrastructure to serve her. It’s wasteful. In 29 countries, more than one in five people have an account but have not used it in the past year. Inactivity has increased in the past few years. India accounts for the greatest number of these dormant accounts. In 2014, Prime Minister Modi launched the Pradhan Mantri Jan Dhan Yojana (Prime Minister’s People’s Money Scheme), which required banks to open millions of new accounts. The Guinness Book of World Records recognized the effort when a staggering 18 million bank accounts were opened in a single week. This campaign and many related Indian government efforts show up clearly in some of the Findex results. Bank account ownership in India more than doubled since Findex began in 2011. But more than a third of those accounts appear to be idle, even using the very soft definition of “active” as one transaction in a year. Beyond the positive headlines, the data raise some issues: First, focusing only on active accounts, the number to remember is that across the developing world, only 48 percent of adults have accounts, whether at a financial institution or mobile money provider. But the second problem with the World Bank’s positive Findex spin is even more important than slow growth in active accounts. Savings and credit are at least as important as accounts when it comes to indicators of financial inclusion. But little or no progress is apparent in either. More precisely, since 2014, in the developing world as a whole, savings is down and credit is flat. Credit is flat, and savings is declining, even as digital payments make significant gains. Take savings, a stepping stone to better financial health. If access to accounts is making a difference in the lives of the newly included, this should show up in more people saving. Instead, the fraction of people who saved through a formal account – 20 percent – was slightly lower than the 22 percent reported in 2014. The segment saving for retirement fell to a very low 15 percent in 2017, worrisome indeed as the global population ages. On the credit side, the number of people borrowing from a financial institution increased very slightly in the past three years. However, the data do not provide evidence that the new and much-lauded forms of digitally delivered and big-data-based credit have substantially boosted access. Fintech innovations using algorithms, machine learning and artificial intelligence for credit scoring may revolutionize access to small loans, but as of 2017, either they are simply transforming the way credit is provided to existing groups, or they have not yet achieved transformative scale. The lack of progress on savings and credit could help explain why the Findex responses to the question on financial resilience – whether a person can quickly come up with money needed for an emergency – also failed to show improvement. Findex results offer one important bright spot: digital payments. We are witnessing an enormous transformation in the infrastructure of banking, as more people use digital payments to send and receive money and to buy goods and services. In the developing world, 44 percent of the people surveyed had used digital payments in the past year, up solidly from 32 percent in 2014. All kinds of digital use cases are increasing, from online purchases and direct deposit of salaries to paying utility bills through an account. There is a clear and convincing trend – even if there is also a long way to go before the developing world reaches the degree of digitization common in high-income countries, where 91 percent have made such payments. The emerging digital infrastructure may one day support the financial well-being of most of the world’s people. But we’re not there yet. The latest Findex results set the stage for the financial inclusion community to reflect and reconsider its assumptions so that everyone working in this field can better ensure that access to accounts and payments translates into active use and benefit for the 3 billion financially underserved people around the world.